You may have seen a new trend in ice cream in the past five years or so. Gelato shops are opening up all across the United States. At Mochi, we love innovative takes on what ice cream is and what it can do, so it’s all the more exciting for us. Because our company has thrived on new innovative takes on ice cream, we like to try different ones from around the world. While people love both gelato and ice cream, most people don’t know the discernible differences between the two. Here are a few of them so you know the difference next time you’re looking for a sweet treat. Part of the process of making gelato is getting rid of any air pockets while it’s churning. They do this by churning gelato much slower than your traditional American ice cream. Because of this, gelato ends up being much more dense than regular ice cream. You might notice that when you go to a gelato shop, the servings often seem much smaller than those that you’d get in an ice cream shop. The reality of the situation is that you’re not actually getting less sweetness, it’s just that the gelato is so dense that the serving size seems much smaller. Because gelato uses much less cream and sometimes no egg yolks, it ends up having a much lower fat content than your traditional ice cream. This has made it really popular in the United States, as people are becoming more health conscious, but still want to enjoy as many sweet treats as they possible can. In lieu of eggs and cream, gelato ends up using much more milk in order to make it. Because of this, gelato ends up having much less flavor by itself, so it needs to rely on the ingredient that you’re trying to emphasize in order to provide the flavor for the dish. While ice cream is an all encompassing, full experience, gelato relies solely on the active ingredient to provide the flavor. Ice cream has a distinctive taste that makes it ice cream, it has a buttery, sweet, full taste. Instead of having a distinctive taste that is all its own, gelato is a vehicle for other flavors to be enjoyed. If you decide to get some raspberry gelato, you’re going to get a burst of raspberry and nothing else. This is one of the main differences between gelato and ice cream. 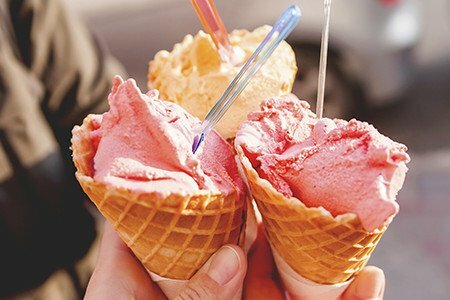 While both gelato and ice cream are both delicious treats that practically everyone enjoys, they do have some distinct differences that set them apart from each other. Ice cream is light, airy, buttery, and full of fat, while gelato is dense, less fat, and emphasizes the active ingredient to provide the flavor for the dish. If you get the opportunity, try them side by side and see if you can tell the difference.